Join the "more brave than brilliant" aviatrix Rita James on a quest to rescue her kidnapped father in Escape from Thunder Island. In this thrilling and amusing game, Rita and her crew land on the dangerous island filled with Jungle Killers, Flesh Eating Monsters and Creatures of the Underworld! Can Rita find her father before a volatile volcano explodes and consumes the entire island? 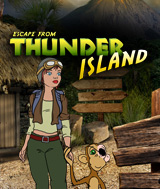 Even more troubles arise when Rita discovers that she and her crew are not the only ones on the island... Can you...Escape from Thunder Island?